The wind shifted at some point during the night bringing in warm air and big soft snow flakes that slowly floated to the ground. I love snow, but I usually don't like being outside when it's snowing - at least in the polar regions (although most times I don't have a choice) as the snow is a direct result of 'warm' air masses which often makes keeping dry difficult. I've said many times, I prefer 30 below to 30 above for this type of travel. I also woke up with the sinking feeling that this would the day, the first day that anyone here could remember, that the North Pole season would be cancelled. We've been on a roller coaster over the past several days which spanned the entire gamete of emotions: from the stress of packing everything on time to the initial delay, and then the continuing uncertainty of having absolutely no control over the situation. Last night, I went to sleep with feeling that this was the end. This morning a note from Vicaar, the agency coordinating the construction of Barneo, brought a little hope. Everyone will loose I thought if the season gets cancelled. I tried not to think of the implications - missing my daughter's birthday (again), two or three weeks in Longyearbyen basically tearing up money every day that I am here and all with no result. I'm all about the journey, but in the businesses of guiding extreme expeditions to the North Pole the destination is equally important as well. At 5:00 all the Last Degree teams in Longyearbyen once again assembled for a (another) debrief. Unanimously, we all wanted to hear a 'yes or no'. In the end, there were a lot of questions and still a few uncertainties, but the original plan of flying to the ice in a Ukrainian AN-74 was abandoned (the plane had already left Longyearbyen) as there was no way in the foreseeable future that permits would be issued. Instead, one of the earlier plans... hiring a plane from Canada - Kenn Borek's Balser BT-67, an updated DC-3 often referred simply to as the 'Basler' would be adopted. 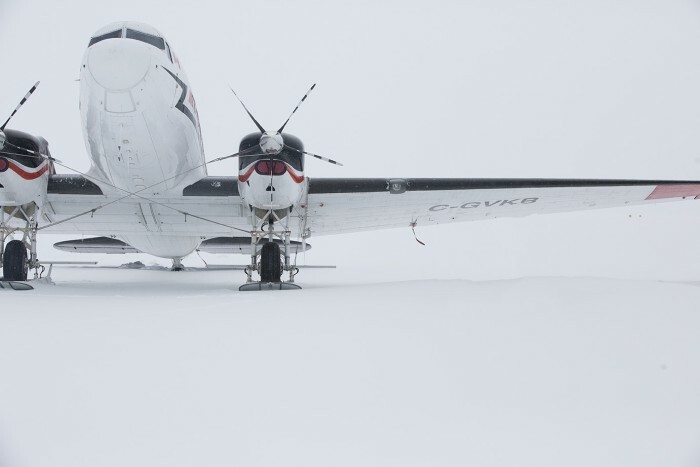 This would require a few more steps in getting both the plane and crew to Longyearbyen as well as initial test of the ice runway at Barneo, but none of these steps were an insurmountable road block and more or less standard operating procedure. Simultaneously, there is still work to get another Antonov here, this time from Iran - which I couldn't help but wonder if these efforts would be thwarted not by Putin but rather Trump this time. Of course, the statement was tongue and cheek but you can't help but feel a little like a pinball being banged around by (political) forces beyond our control. If Russia and Ukraine don't want a Ukrainian plane to fly to the Arctic, you can almost guarantee that certain Americans might not want an Iranian plane to fly there as well. Humorous (kind of) conjecture of course. And side note, but really a main note: please completely disregard this paragraph. My team, now having been through so many of these ups and downs, immediately had a (yes another) meeting where each person, in turn, stated their observations and opinions. It has been rewarding to see everyone come together as a group and make (and discuss) these hard decisions. While not life and death, these are stressful situations to be caught up in where no path is the best option. Still, that is polar travel to a 'T'. We are constantly moving into uncertainty and having to make (and execute) a plan to deal with the conditions. Tomorrow, more details on how we're getting to the ice.